The information quoted below is excerpted from the report "Family Breakdown in Australia  An attempt to get at the truth about the magnitude of the problem" by Malcolm Mathias, president of the Lone Fathers Association of Australia Inc.
Update 2004 09 23: The PIR Independent Research Group published a report on a thorough review of the Australian Child Support Agency (2004 09 22). The PIR CSA-Review contains the latest compilation of estimates on men's suicides caused through Draconian, oppressive and exploitative enforcement of CSA rules. That information from the PIR report has been appended. If you don't have the time to read all of the text below, check at least the graph. "There is a growing feeling that the loss of family can now be measured directly in poor achievement at school, unemployment, bankruptcy, domestic violence, homelessness and suicide." "It is in the best long term interests of the children and both parents that payments are maintained for as long as possible. Short term gain for the custodial parent becomes long term pain for the children and the non-custodial parent in the longer term. After only five years the financial burden becomes too great, and many non-custodial parents are forced to look at other financial and "life" options. Many non-custodial men are forced to live in cheap accommodation (or move back in with often pensioner parents), are compelled to leave paid employment, forced into bankruptcy, lose contact with their children, lose any prospect of a comfortable retirement and a growing number ultimately commit suicide.&nbsp; Many innocent men do not survive this draconian system." The recent Men and Family Relationships conference conducted by the Federal Attorney General in Canberra (June 9-11, 1998) suggested the need for marital counselling before family breakdown, and recognised the "situational" nature of domestic violence, which was non-gender specific. Non-custodial parents are plunged into emotional turmoil following family breakdown.&nbsp; Government services must be put in place to support "non-custodial" parents. It is hoped that this type of service would reduce the suicide rate among non-custodial men." For some the only solution to family breakdown is suicide. The number of divorced men choosing suicide as the means of ending their heartache, pain and suffering has increased since the introduction of the Child Support Scheme. This supported by the ABS Suicides Australia 1982-1992, Pub No 3309.0. [The callousness of society towards men is quite well reflected in the "Not Stated" column. We don't even care enough about men who committed suicide to determine their marital status as often as we do with women when they committed suicide. It would make an interesting study to determine why that happened, although, to be objective about it, it didn't happen as often anymore from 1887 on. Did someone suddenly develop a conscience? "In analysing suicide by marital status i.e. whether persons were married, divorced, widowed or never married, only the population over the age of 15 years was included. Of the four marital status categories, divorced persons had the highest average crude suicide rate over the period 1982-1992 with 34 deaths per 100,000 of divorced mean population. Divorced females had a higher suicide rate than females in any other marital status category with 18 deaths per 100,000 of the divorced female mean population during the reference period. By comparison, divorced males had an average crude suicide rate of 54 deaths per 100,000 of the divorced male mean population. The highest proportion of suicide deaths for both divorced males and females occurred in the 35-44 years age group with 32 per cent and 31 per cent of total suicides for divorced males and females respectively. Persons who had never married had the next highest rate of suicide for the reference period with 21 suicides per 100,000 of the mean population. The average crude suicide rate for males who had never married was 32 deaths per 100,000 of the male never married mean population, while the female rate in the same category was 8 deaths per 100,000 of the female never married mean population." "The highest proportion of suicide deaths for both males and females who had never married occurred in the 15-24 years age group. Forty five per cent of both male and female suicides in the never married category occurred in this age group. This age group also represents the highest proportion of never married persons.&nbsp; The proportion of the never married population in the 15-24 years age group has increased over the reference period. In 1992 the median age for males to marry was 26.9 years while for females the median age was 24.7 years. 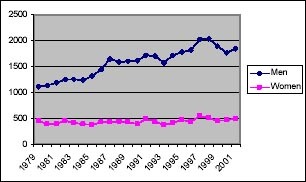 By comparison the 1982 median ages at which males and females married were 24.6 and 22.4 years of age respectively. 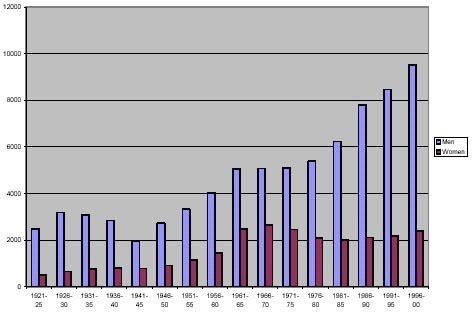 There were 5 female suicide deaths per 100,000 of the female never married mid-year population in the 15-24 years age group for the period 1982 to 1992, compared with 24 male suicide deaths per 100,000 of the mid-year population in this age group over the same period. By contrast the age-specific death rate in the 25 years and over age group for the period was 13 female suicide deaths per 100,000 of the female never married mid-year population and 46 male suicide deaths per 100,000 of the male never married mid-year population. The widowed population had an average crude suicide rate of 20 deaths per 100,000 of the widowed mean population. The male suicide rate for this marital status category was the highest for males in any category with 56 deaths per 100,000 of the widowed male mean population. Widowed females recorded a suicide rate of 11 deaths per 100,000 of that mean population. The highest proportion of suicides in the widowed category are in the older population.&nbsp; Males most at risk appear to be in the 75 and over age group which contributed 40 per cent of the total widowed male suicides. Females in the 65-74 years age group had the highest proportion (35 per cent) of widowed female suicides." "The pain of separation (and divorce) from your partner is clearly reflected in the suicide statistics for both widowed and divorced persons. Divorced males are also forced to endure the pain of separation from their children (92% of men do not get custody of their children), on top of the pain of separation from their partner. It is therefore not surprising that divorced men suicide 3 times more frequently than divorced women. Further study of the "never married" and "married" categories may reveal further evidence of the effects of "Family Law" and the "Child Support Scheme." There were 143,800 "never married" Lone Mothers with dependent children included in the ABS Family Characteristics study (Pub No 4442.0). If some of these pregnancies were planned by the mother to take advantage of social welfare and child support payments, then some of the "male youth suicide problem" may also be a "Family Law" and "Child Support" problem. Young males suicide at a rate of 24 male deaths per 100,000 of the mid-year population in this age group (15 -24 years), while young females suicide at a rate of 5 female deaths per 100,000 of the female never married mid-year population in this age group. Young males suicide 4.8 times more frequently than young females. The suicide rates for married people clearly reflect the desirability of marriage for both males and females. When do suicides in marriage occur? Is it the impending marriage breakdown which brings on suicide for both male and female, or are there other factors? More research is needed. 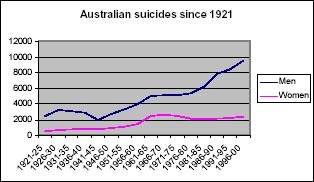 "Further data on suicide rates for the period 1993 to 1996 are available from the Australian Bureau of Statistics for their minimum charge of $100. Unfortunately, voluntary organisations like the Lone Fathers Association of Australia Incorporated find it very difficult to allocate $100 of their scarce resources to obtain the more recent, but as yet uncompiled, data." Many men are paying a heavy personal and family price for the "feminist" movement. Men appear to be more loyal to their marriage vows, and are more distraught after marriage breakdown. Many women go through a grieving process while they are secretly planning the marriage breakdown, and it often takes men by surprise. Women now feel more empowered to pursue a more egocentric lifestyle without the encumbrance of the now unwanted husband. Freedom for liberated women by their choice is one thing, rewarding them with a favourable property settlement, custody of the children, significant Government welfare support and child support payments is an entirely different matter." [However, to be a single mother and a successful parent is no easy task. In all of this acrimony between government-sponsored, anti-family interest groups and non-custodial parents, although they are often mentioned, the welfare of the children is often totally ignored. We should always keep in mind a picture of a society in which today's children will be tomorrow's adult citizens. Father-absence hampers them in achieving their full capabilities (we have more than enough evidence to support that) and thus on average makes them less than fully functioning in every imaginable way. To deprive children of their fathers (or their mothers for that matter) is to impose a big handicap on them. That handicap will make itself felt for as long as they live. That then means that all of society will have to bear the consequences of that handicap, now and in the future. The consequences are lower productivity and higher crime rates. Nobody in the next generation will thank this one for producing so many fatherless children. To be a good parent is a great responsibility and a difficult obligation. It is hard for a set of two parents to be successful in that duty and far more difficult for just one parent who can't possibly be successful in filling two different pairs of boots. Not one single parent can be completely successful in filling the role of both, mother and father. "The current financial incentives offered by the welfare system through sole parent pensions, combined with the "guaranteed" child support payments, are contributing directly to family breakdown, and consequent suicide rates." The full PIR report (24 pages, 192 kB PDF file) is available at the PIR website and at the website of Fathers for Life. The PIR asks that the report receive wide distribution. In the course of our investigation, PIR has become aware that fathers and family law reform groups have consistently reported over many years that relationship breakdown and the resultant involvement of the Child Support Agency is a major contributory factor to the suicide or death from stress related illness of paying parents. It has been claimed that at least three clients of the Child Support Agency suicide each day. The three a day figure is arrived at by deducting those who are too young or too old to be likely clients of the Agency from the overall suicide figures and then taking 70% of the remainder in the prime divorce age range as likely to be clients. Professor Pierre Baume from the Centre for Suicide Prevention, Griffith University had previously found that 70% of adult male suicides were preceded by a relationship breakdown. Some groups claim that the mortality rate of child support payers is likely to be higher than the suicide figures alone suggest; with for example the divorce age group being the only age group showing an increase in fatal car accidents and it also being an age group with significant health issues. The CSA has repeatedly refused to attend the inquests of child support payers, claiming confidentiality. Despite ongoing requests from a number of quarters, the Agency itself, and the politicians responsible for it, have consistently refused to release any data on these deaths until recently. After the installation of a new computer system CSA claims it is now able to supply the relevant data. The chart below, based on the same data, also helps to illustrate the rapid rise in suicide levels since the introduction of the Child Support Agency for those aged over 20. With youth suicides static or decreasing, all this increase has been driven by men in the divorce age bracket. It would appear the senior officers of the Agency have not fully informed successive ministers as to the keeping of records on the deaths. Clearly there has been no public policy response to these deaths. There has been no critical incident team to deal with the trauma to parents, children and extended family. There also appears to be no policy mechanism in place to prevent the taxpayer from having to carry the burden of cost other than the aggressive and ham-fisted approach at making claims against the dead persons estate. This anti-male culture is contributing to the destruction of careers, mental health problems and it would appear to national male suicide rates. The system is not fair, not just and certainly not equitable between men and women. It is demonstrably wrong to have a system in place under which in some instances a man must pay $2100 a month for his three children plus support himself and his new partner. As if the loss of all things materialistic and his children was not enough he is now being prevented from embarking on a new life because of these unrealistic expectations from the Child Support Agency, Mr Schultz said. The CSA must be dismantled and reconstructed. The system as it is being administered is not fair, it is unjust and it is inequitable. It is obvious there is discrimination and a mindset against men, to the point where it is really disturbing." The full PIR report (24 pages, 192 kB PDF file) from which the preceding quotes were taken is available at the PIR website and at the website of Fathers for Life. The PIR asks that the report receive wide distribution. The Politics of Fatherhood, Stephen Baskerville, Ph.D., Howard University; peer-reviewed article in PS: Political Science and Politics, vol. 35, no. 4 (December 2002).